Layovers can be stressful. Every airport is different, and it’s hard to tell if your layover is long enough to make your connection. When booking a flight, you should always give yourself plenty of time in between flights, especially if you’ll have to go through customs and immigration. 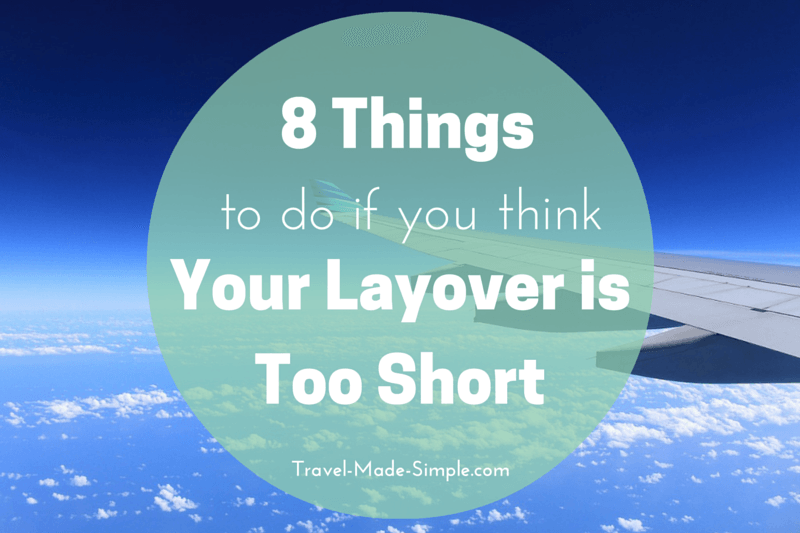 But what if you’ve already booked and you think your layover is too short? Here are 8 things to do to reduce your chances of missing your connecting flight. 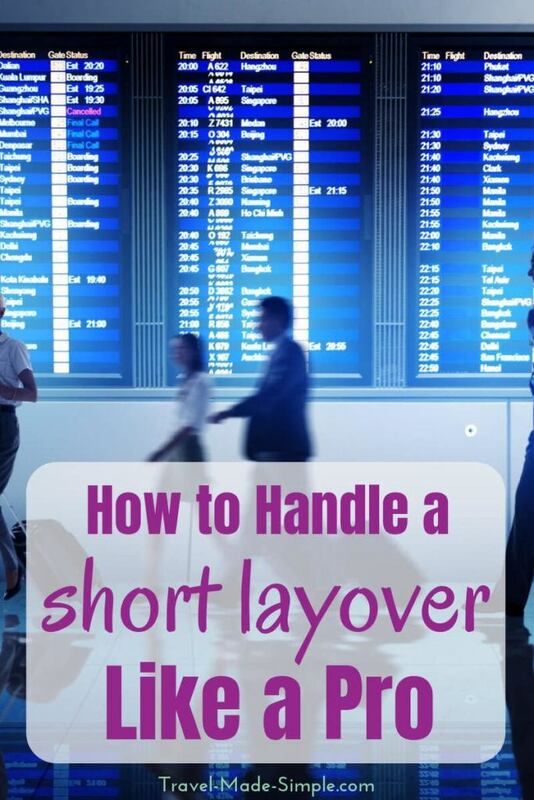 If you notice your layover is too short, consider changing your flight. Call the airline and see if there’s a better connection by either taking an earlier first flight or a later second flight. Explain why you want to do this and ask about any applicable change fees. It’s possible this option might not be reasonable if the cost is too high. In that case, ask what the airline’s policy is if you miss your connection. Unfortunately most airlines put the responsibility on the passenger to make the connection, which means they wouldn’t be any help if there are no delays and you miss your connecting flight. >>Check out these layover perks you never knew about. If you think your layover is too short, do what you can to get an aisle seat and a seat as close to the front of the plane as possible on the flight before the short layover. This will make it easier for you to get off the plane quickly once your flight lands. Either choose your seat online or ask at check-in if they can change your seat. Explain that you have a short layover. You never know, it could lead to some helpful sympathy. If you don’t have an aisle seat and you aren’t able to change your seat, talk to the people sitting next to you. Someone might be willing to switch, or at the very least, they might let you squeeze ahead of them when the plane lands. Also talk to the flight attendants about the possibility of moving to the front of the plane towards the end of the flight. It won’t always work, but it doesn’t hurt to ask. Flights can be boring, so you probably have a book, Kindle, music or something else to keep you entertained. But if you think your layover is too short, don’t wait until the plane lands to pack up everything. When the plane starts to descend, pack everything back into your carry-on bag. This means you’ll be ready to go the moment the plane is on the ground and the seat belt sign has been turned off. Speaking of luggage, if possible travel carry-on only. Short layovers aren’t just a problem for you; they’re a problem for checked luggage too. If you think your layover is too short and you travel carry-on only, you won’t have to worry about your luggage getting left behind during your layover. Sometimes the flight attendants get a list of gates for connecting flights. They will usually make an announcement towards the end of the flight, but if they don’t, just ask if they have a gate listing. That way you’ll know if you’re flight is landing in the same terminal as your connecting flight or if you’ll have to change terminals. Search for the airport your layover is at along with “terminal map” so you can get an idea of the layout ahead of time. This will help you feel a little more comfortable once you arrive at the airport, though remember that airports have plenty of signs pointing you in the right direction. Another good place to look for airport information is the World Airport Guides website. It has terminal maps for some airports, listings of which airlines use which terminals, transport information, plus restaurants and other services. Many people use layovers for bathroom breaks and food stops. But if you think your layover is too short, it’s not worth taking the chance. Either go to the bathroom on your first flight or wait until you’re on the second flight. As for food, pack some snacks in your carry-on or buy something on the plane if food is not included with your flight. I think this is a good idea for flying no matter what, but it’s especially important if you think your layover is too short. Uncomfortable shoes, high heels, or new shoes you haven’t broken in yet will slow you down. You want to be able to walk quickly, or even run if it’s absolutely necessary, to make your connecting flight. Small things can go a long way if you think your layover is too short. Politely ask for help along the way, do what you can to save time, consider traveling with only carry-on luggage, and prepare ahead of time. I really like how you state the wisest and most obvious option first (where possible). That is to foresee that it will take some considerable time, especially in Europe and the United States to change flights and terminals and that flights can and do run late meaning your layover is too short, to your detriment. They can also get cancelled too, sometimes at little or no notice at all. Customers of Tiger and Jetstar airlines in Australia know what I’m talking about here. There is a silver lining to this in that if somebody is smart, they will realize that some airlines have better reputations than others regarding delays, cancellations and their policies about them too. 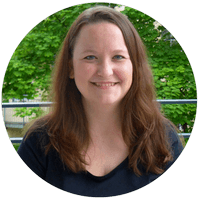 There are frequent flyer travel blogs and communities out there, the Australian Frequent Flyer being one of them, where seasoned travelers talk about the airlines and what experiences they’ve had with them over the years. This allows you to benefit from their combined experience and to make wise decisions before you leave home. Staying on the topic of layovers though, I think if you’re going to have a layover in your itinerary,you should seriously consider insurance for cancellations and the potential for your luggage to be lost if you’re traveling with different airlines. Buying new airline tickets on the spot because an airline won’t honor your tickets from a flight you’ve missed and/or having to buy additional clothes at your destination or along the way can put a huge dent into your holiday funds. Honestly, though, I would rather pay the extra money for a direct flight if it’s possible and not even have to consider a layover. But I understand that it’s often not possible physically or financially for some people to do. Thanks Matthew! I’m with you, I’d rather take a direct flight whenever possible, but sometimes it’s not possible at all. You’d never be able to get from Europe to Australia in one flight. Just one example. I’ve never looked at insurance for flight cancellations, might be interesting to see if it’s worth it. I know people sometimes get stuck in pretty bad situations when a flight is cancelled, but for the most part the airline has to find another solution for you if they cancel your flight. And yes, some of those frequent flyer blogs are really good! Short layover are so stressful … usually, I aim for at least 2 hours at a connecting airport to avoid problems. That said, great tips! Thanks David, I agree, at least 2 hours. But often there isn’t another option, so hopefully this helps out those who get stuck with the short layovers. I’m flying out of RDU with a 53 min layover in ATL. I’m afraid my checked luggage won’t make my next flight. I’m flying Delta for both flights. I can bring it on the plane but afraid it won’t fit with everyone’s carry on. Plus a lot of cramming into my bag. My destination is Ft. Myers. Luckily I have a long layover on the way home. Btw both flights are on the same itinerary. Hi Deb! I wouldn’t worry about other people’s carry-on. There will always be lots of people bringing big bags, and if your bag legitimately fits within the airline’s carry-on restrictions, you will be fine. They will gate check other people’s luggage that is too big. BUT if you think your luggage is too big, or if you think you’ll have too much stuff, you should check it. 53 minutes is a short layover, but it’s not SO short for a domestic flight. I hope your bag makes it, and let me know if you have any other questions! I am travelling from Kathmandu to Boston and have a 1 hr 35 minute layover in Dubai. I am arriving in Dubai on Jetairways and leaving on Air Canada. I will have to pick up my luggage and recheck it on Air Canada. Do you think I have enough time? My other option was to ship my luggage from Kathmandu but its expensive and seems to be unreliable. Hi Lynne! Are your flights on 2 separate itineraries? Is that why you have to pick up your luggage and recheck it in Dubai? If the flights are on one itinerary, the airlines should transfer your luggage, but if they’re on separate itineraries, you will have to claim and recheck your luggage. That also means you’ll have to go through customs in order to get to baggage claim, and that will take longer. An hour and 35 minutes isn’t completely impossible, but I don’t really think it’s enough time, especially at a busy airport like Dubai. Is there a way you could get an earlier flight to Dubai or a later flight out of Dubai? I realize that might not be an option, but if your flights are on separate itineraries and you miss your connection, Air Canada will not be helpful in getting you onto another flight, and it’ll be even more expensive than if you just change one of your flights now. Thanks Ali! Yes they are two separate itineraries and that was exactly what I was thinking (not enough time) I have tried looking for alternate flights or even cancelling and rebooking but the costs are alot or not till the next day. One other thing I had thought of was to ship my bag from Kathmandu. Do you have any experience with that? There is a UPS office there and I think DHL and other shipping agencies. The only time I’ve ever shipped luggage was from one end of Germany to the other, so I don’t know much about it. UPS and DHL should be reliable, but I can’t say either way if that’s a good option or not. If you do it, definitely make sure you keep anything valuable in your carry-on. I wish I could help more! We are travelling to Mexico and will be flying into Toronto from there with a 1hr 46mins layover. Will we have to go thru customs there and then reboard to fly home? if so does this seem like a long enough time to do it? Hi Bill! A 1 hour 46 minute layover might be a bit tight, but I wouldn’t say impossible. The Toronto airport actually has a great guide for dealing with your connections, so start here: http://www.torontopearson.com/Connecting.aspx# It looks like some of it depends on the airline(s) you’re flying, but this will give you step-by-step instructions on what to do. Toronto also has a US customs area, so you go through US customs while technically still in Toronto. Normally this is pretty helpful, but I imagine in your case, it might take more time. I used Air Canada just to see what it would give me, and it looks like you wouldn’t have to deal with Canadian customs at all, so that would help on time, BUT it looks like that only applies to flights in terminal one. 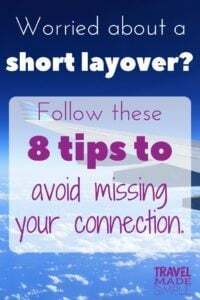 Sorry I can’t give you a definite answer on this one, but check out the info on those sites, and read through my tips for short layovers here. If you’re still not comfortable with the layover time, call the airline and see what their policy is if you miss your connection due to customs/immigration taking too long, and see if they can change either flight to give you more time in Toronto. Hi Lorraine! If both of your flights are with United and were booked on the same itinerary, they will transfer your luggage from the first flight to the second flight. If you already know the first flight lands in the same terminal where the next flight departs from, I think 47 minutes should be enough time. All you should really have to do is find your next gate. Hi Beth! You should be fine with 1 hour 50 minutes in Amsterdam. Your checked luggage will get tagged to your final destination and transferred from one flight to the next, so nothing for you to do there. When you get off the plane in Amsterdam, look for signs that say “transit” or “transfer” or “connecting flights” and you should be able to bypass customs and immigration since you aren’t staying in Amsterdam or anywhere else in the Schengen Zone. You will most likely have to go through security again. You should also see departures boards listing upcoming flights, so find your next gate so you’ll know where you’re going. It’s a big airport, but it’s well marked, and if you get confused, there are plenty of people who can point you in the right direction. And remember, you’ll be fine! Let me know if you have any other questions, and enjoy your trip! I’m arriving from Japan and I have a 1 hour and 50 minute layover in California (LAX) to a connecting flight to Washington DC (through United). Do you think it is enough time to go through customs and security? If not, do you think changing to a later flight is the best option? Hi Mary! A 1 hour 50 minute layover at LAX is cutting it close. It’s not impossible, but you do have to keep a few things in mind. It’s a big airport and a popular one for international connections, which means potentially dealing with long lines at immigration/passport control and customs. You will have to claim and recheck your luggage, if you’re not traveling carry-on only, which could mean another line to recheck your luggage. You’ll also have to go through security again, and again, deal with a long line. Like I said, this isn’t an impossible layover, but if there’s another flight option that isn’t too much more expensive, it might be worth changing. LAX is a notoriously annoying airport for international layovers. That said, if it’s too expensive to change the flight and you decide to try this one, definitely follow as many of these tips as you can. Good luck with whatever you decided, and enjoy your trip! Have a very short layover of 35 minutes at Vienna airport, arriving from TIA going to BUD. Both flights with same airline (Austrian), so it should be okay, right? I mean they would not list it as bookable if it was not enough time? Will they wait for me in case I am late? Or can I in any case ask for one of those golf-cart type of vehicles to transport me faster? Hi Jenna! Yikes, 35 minutes is really short. And unfortunately, yes airlines do often give you the option to book a layover that isn’t really long enough. When you land in Vienna, you’ll have to go through immigration and customs since TIA is outside of the Schengen Zone but VIE and BUD are in Schengen. You have to go through customs and immigration at the first Schengen airport you get to. Here’s the map of the Vienna airport: http://www.viennaairport.com/en/passengers/airport/airport_map If you are able to find out which terminal the VIE-BUD flight leaves from, this can help you determine the distances a little. You can certainly ask if they can drive you in one of those golf cart things, but usually they’re for people with disabilities. But it doesn’t hurt to ask. I think it’s also worth calling the airline and asking them what their policy is if you miss your connection because the layover is too short. Sometimes an flight will wait for passengers from a connecting flight when they know there are a lot of people on a particular flight or if the first flight is a few minutes late, but I wouldn’t count on that. If Austrian Airlines is able to change you to an earlier TIA-VIE flight or a later VIE-BUD flight, you’d be better off. It’s not a huge airport, but big enough that I’d worry about making a 35 minute connection with customs and immigration involved. Hi, I’m arriving into LAX on a Friday at 6:05 pm From Tokyo Narita and then connecting to Boston at 9:07 pm. Is 3 hours enough time to get through immigration, pick up my bags and get back through security? Hi Marianne! Yes, I think you should be fine with a 3 hour layover in LAX. Anything less than 2 hours there and I’d worry, but 3 hours should be fine unless something crazy happens. I usually try to go to the bathroom on the flight before landing so I don’t have to worry about it during an international layover, and I don’t make any stops for food or anything until I get to my next gate and I know how much time I have left. Enjoy your trip! HI. My husband and I are traveling from Brisbane to San Francisco with a two hour stop in Sydney. Will this be enough time to get our connecting flight. Hi Val! Yes, I think 2 hours in Sydney should be enough time. You should get both boarding passes when you check in at Brisbane Airport, and in Sydney you’ll have to get stamped out of Australia and go through security again, but your luggage should automatically get transferred from one flight to the next. Enjoy your trip! Comments go into moderation if you’ve never commented on the site before. Helps prevent spammers. Hi, I’m flying from Boston to Mexico on Memorial Day May 30th with layover in Newark for 42 minutes. I have been checking and seems arrival and departing connection are in the same concourse (C).. We are seated on 36 ABC. and we have to check bags. Do you think it will be enough time to catch the connecting fly ?. What could happen if we miss the connection ? Changing flights from Boston -EWR is not an option since fees are astronomical . One of our pax is handicap. would this situation give us any consideration ? Hi Luis! 42 minutes is a little tight, but not impossible, especially if your arriving and departing flights are both in the same terminal. It’s probably worth asking for assistance for your passenger who is handicapped. Contact the airline ahead of time and tell them you will need assistance for your friend/family member during your layover in Newark, and they should be able to help you out. If he/she can get on and off the plane unassisted, or with your assistance, that will probably save time since wheelchair assistance usually means waiting until everyone else has gotten off the plane. Either way though, I think they usually let the next flight know they’re bringing someone, but verify with the airline when you speak to them. I don’t know what your layover looks like on the way back from Mexico, but if it’s short like this one, I’m not sure you’ll make it. On the way back into the US, you have to go through passport control/immigration and customs, plus claim and re-check your luggage, then go through security again to get to your next gate. A 42 minute layover is almost guaranteed to be too short for that. If you miss your connection because the flight was delayed, the airline should be able to put you on the next available flight. But if you miss your connection because the layover was too short, it varies from one airline to another as to how helpful they will be. I hope this helps, and enjoy your trip to Mexico! Hello! I have a connecting flight in BWI from Pittsburgh to Boston. The layover is 55 minutes. Both flights are Southwest and will be in the same terminal. I will have checked luggage. Do you think that 55 minutes is enough time? Hi Ceecee! As long as your flights were booked together on one itinerary, I think you’ll be fine. It helps that your flights are in the same terminal so you won’t have far to go. Probably best to keep an eye on the time once you land and find your next gate first thing before deciding if you have time for a bathroom stop or whatever, but 55 minutes should be ok. Have a good trip! If I leave MCO on a 1:55pm flight arrive at JFK at 4:30pm on JetBlue Terminal 5 and I need to get to Terminal 4 for a 7:20pm Air France flight. Will I have enough time to make the connection? Hi Brittany! That sounds like plenty of time to make your connection. One thing though, are those flights booked on one itinerary or did you book them separately? I don’t think JetBlue and Air France are partner airlines, which means JetBlue might not be able to print your Air France boarding pass or tag your luggage to your final destination. If that’s the case, you’ll need to pick up your checked luggage in JFK and take it to an Air France counter to recheck it and to print your boarding pass. Hi Ali! I’m flying as an unaccompanied minor (un-atteneded) from BOS-YHZ-YQY. The layover in Halifax is only 1hr 35mins and I’m worried that if I’m required to sit at the rear of the plane to be close to the FAs, I won’t be able to make it to the gate in time for the departure. Although the plane is only small (CRJ-700), and I booked with the same airline on the same itinerary is there anything else I should know or take into consideration? Thanks! Hi Michael! First, that’s a pretty small plane, so even if you have to sit in the back, there won’t be sooo many people in front of you. And if you’re an unaccompanied minor, I think the FA’s all know you’re there and will watch out for you. So talk to them, make sure they know you have a somewhat short layover. I don’t actually think 1 hour 35 minutes is horrible for Halifax since it’s a small airport, but you don’t want to waste time. Each airline has its own rules about unaccompanied minors, so make sure you understand your airline’s rules. Since you’re going unattended, I assume that means you’re old enough to not need an airline employee to take you from one place to the next, but I think the airline would still notify the next flight that they have an unaccompanied minor coming from a connecting flight. Ask when you check in for your flight in Boston if the YHZ-YQY flight knows you’re coming, because you’re nervous about the layover. No one wants to be responsible for a minor getting stranded! You’ll have to go through immigration and customs in Halifax. Follow the signs for immigration or passport control, and really, you should be able to just follow everyone else from your flight. You will most likely have to claim and recheck your luggage, but it’s usually a simple process. Ask an airline or airport employee if you get confused. I hope this helps! Definitely ask the airline for more clarification on how things work, they’re there to help. Have a great trip! Is that enough to time? Will I have to go through customs in Frankfurt even if I don’t have a checked bag? Hi Sumer! An hour 30 minutes is a bit tight but not impossible. My experience getting through immigration in Frankfurt has always been pretty fast (when I’m entering anyway…lines are often long to go through passport control to exit), but it could be affected by how many other flights are landing at the same time. Yes, you go through immigration and customs there because it’s the first airport you’re landing at within the Schengen Zone. You will not go through immigration and customs in Nice since you will already be stamped in. I am travelling from Beijing(15:40pm) to Salt Lake City and have a 2 hr 40 minute layover in Seattle. I am arriving in Seattle(11:35a.m) on Hainan airline and leaving on Alaska airline,the flights are on one itinerary, Do you think I have enough time,especially at a busy airport like Seattle?Thanks! I’m flying from DC to Austin but a layover of 45 mins in Dallas. Same airline (AA) but different terminal. I’m planning on having a checked bag. Do you think 45 mins is enough? Since it’s the same arline they will transfer my luggage from first flight to second flighg right? Hi Chris! Yes, AA will transfer your checked luggage from one flight to the next, as long as your flights are booked together on the same itinerary. A 45 minute layover seems a little tight to me, but it’s not impossible. According to the Dallas airport website here, they have a train that connects all terminals inside of security, so you should be able to get to your next gate without having to deal with TSA again, so that will save you time. You don’t really have any time to waste, but follow my advice in this post, and I think you’ll make it. And if you miss your connection because your first flight is delayed, the airline will get you on another flight. I am looking at flights from PHL to Medford, OR and the only one I can find from United (I choose United because of a $150 voucher I have) is a flight that has a layover in San Francisco that is only 55 mins. Is this enough time? Furthermore, there will be a 58 min connection on the way back in between SFO and PHL. Hi Robert! I think you’ll be ok. It’s a domestic flight, so you won’t have anything special or complicated to deal with. You might have to go through security again depending on whether you have to change terminals, but I imagine the lines shouldn’t be too terribly long with only a handful of gates in each terminal. Here’s an airport terminal map and a list of which sections can be reached without having to go through security again: http://www.flysfo.com/flight-info/security. I’d recommend finding your connecting gate before doing anything else, like stopping for the bathroom or food, to make sure you have enough time, but I think you’ll be ok on this one. Have a great trip! Hi. I have a flight from Toronto to Beijing with a 49 min layover in Washington DC. Both flights are with United, booked under the same itinerary. I will probably have one checked bag. What do you think? Hi Yafet! Toronto airport has a US customs post, so you will actually go through US immigration and customs while you’re still there. See here for more info. That will save you time when you get to DC. You might still have to go through security in DC though, so 49 minutes could be a little tight. If you can get an aisle seat close to the front of the plane on your Toronto to DC flight, that should save you a few minutes. It could also be worth talking to United and seeing what it would take to get you on an earlier Toronto to DC flight, since I imagine they don’t have a lot of DC to Beijing flights every day. As for your checked luggage, normally you have to claim and recheck luggage when you arrive in the US from an international flight, but it might be different since you will have already gone through US customs before arriving. That is a question for the airline, but my guess is that your bag will automatically be transferred to your next flight. But definitely ask United about that. Hi! I have a flight from chicago (through AA) to Manila,Philippines (through JAL) with a lay over of 1hr & 45mins at Tokyo, Narita, do i have enough time, my first time to travel with lay over. Thank you. Hi Marli! I don’t think you’ll have much time to waste, but I think this should be enough time to get to your next flight. Since you’re not staying in Japan, you should be able to bypass customs and immigration. Look for signs that say “transit” or “transfer” or “connecting flights” and you’ll have to show your ticket and go through security again, but that shouldn’t take too long. Have a great trip! Hi i have a stop over in china which is just 1 hour 15 mins both are southern china airlines one just the one itinerary… do you know if this airport is easy to navigate? And does comprehensive insurance usually cover the cost if the flight is missed? Hi Jessica! Sorry, no I haven’t flown through China. Depending on your nationality, sometimes China requires a transit visa, so you should look up the Chinese embassy and see what the rules are for your country of citizenship. An hour and 15 minutes sounds a little tight, though if you don’t have to deal with customs and immigration, it might be fine. Most countries allow you to skip that if you’re just transiting, so you would follow the signs that say “transit” or “transfer” or “connecting flights” and then go through security and find your next gate. But China doesn’t always do things the same way, which is why you need to find out if you need a transit visa for your situation. And I’m not an expert on travel insurance, so if you’re looking for a policy that would cover that, you would have to ask the insurance company before purchasing a plan. Hi! I am looking at a returning flight from Copenhagen to Los Angeles (LAX) with 1 hour and 15min layover in London (LHR). Both flights are with British Airways. Probably will checked baggage. We are a family of four travelling. Is that enough layover time? Do we reclaim baggage and re-check at LHR? Thank you. Hi Federico! Usually in this kind of situation, you should be able to bypass customs and immigration by following the signs that say “transit” or “transfer” or “connecting flights” and then go through security and find your next gate. Your luggage should be tagged to your final destination too, so you wouldn’t have to claim and recheck it. An hour and 15 minutes is a little tight, but if you don’t have to deal with customs, it should be fine. I’d recommend verifying with the airline because my in-laws did once have to go through customs, but many other times, they have not. I don’t understand why the difference! Hi, I wish I came across this page before my flight. Just want to share my experience and learn if there’s anything I could have done differently! I booked my flights with Expedia on the same itinerary, departing from Toronto for Honolulu and have a 1.5 hour layover at LAX. Both flights are United but the YYZ to LAX flight was operated by Air Canada. When I checked in at AC counter in Toronto, the girl said she couldn’t print the boarding pass for the Honolulu bound flight for me. I thought it’s fine, i would get it in LA. I’ve already passed through US Custom & Security at YYZ. The AC flight was delayed by 30 mins. The decisions I made in next hour after I landed LA determined my fate which is that I missed my connect flight for HNL. First, I followed the crowd to the arrival level and walked to the terminal for the United flight on the ground. Could I have walked thru a ‘connect flight’ passage and bypass the security check again? Second, it was impossible to get a boarding pass thru the kiosk at the counter for a flight so close to its departing time and the United staff were not helpful at all. Could I have insisted the AC staff to print both boarding pass for me at Toronto? Third, should I have allowed at least 2 hours layover when it involves a US city? I heard some fellow travellers were able to get on that HNL flight, so I thought I might have made some mistakes in my logistic. Please advice. Thanks. Candi, I’m so sorry you missed your connecting flight! First, I think it’s strange that the Air Canada agent wasn’t able to print your boarding pass for the flight to Honolulu. United and Air Canada are partner airlines, and that almost always means they can print your boarding passes all the way through. You could’ve tried pushing them a little harder and pointing out your tight layover, but if they truly couldn’t do it, it might not have helped. Obviously I don’t know how their computer systems work. If they said they really couldn’t do it, I’m not sure what else you could’ve done at this stage, other than try to find a United counter in YYZ to see if they could print your boarding pass, but I’m not sure if they could’ve done it from there. There isn’t really a “connecting flight” bypass like in a lot of other countries. The US makes everyone, regardless of final destination, go through customs and immigration. So really nothing you could’ve done differently there. And again, it’s kind of crazy that the United agents wouldn’t print it for you in LA. You’d think they would know if Air Canada wasn’t able to print the boarding pass for you in Toronto. I think when transiting through the US, at least two hours needed for a layover. Maybe even more for an airport like LAX that is so big and sees so many transiting and international passengers. Aside from not having quite enough time for your layover, I think you just had some really bad luck on this one with all the unhelpful airline employees. Most of this was beyond your control. 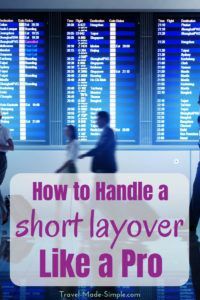 Look for longer layovers next time, and if you have another situation where they won’t print your boarding pass even though the airlines are partners, maybe just say “ok thanks” and find another agent and try again. Maybe even call the airline ahead of time and confirm whether you’ll be able to get all boarding passes at once. The only time I’ve ever not gotten all of mine was with two airlines that weren’t really partners, so they didn’t have access to each other’s system, but somehow Expedia was able to book it all together on one itinerary. Again, I’m so sorry this happened to you, but thank you for sharing your experience, and I really hope it works out better next time! Thanks for your opinions and advice. After 30 hours of waiting and flying, I was able to start my trip the next day, though it’s been cut short for that reason. Despite the awkward beginning, it’s a good trip for me. Thanks again for your comfort and ideas! I’m glad to hear you had a good trip, despite the rough start! I am sweating bullets because I have a flight from Toronto to Anaheim, with a connection at the notorious Chicago O’Hare with only a 55 minute “layover”. I tried calling Expedia to explain that perhaps this was not enough time (When I initially booked, it was about 5 minutes more….so one hour total layover) and was assured that this was within the United/Air Canada guidelines for O’Hare. So, here is the scenario: I have a Nexus card, will easily and quickly clear US Customs here in Toronto, and I know the flight is landing at Terminal 2 at O’Hare, and my connecting flight is leaving from Terminal 1. My flight from Toronto leaves at 7:30am, and my connecting flight leaves at 9:10am. Seeing as though I have a Nexus card, no checked baggage (only carry-on), what are the chances that I can make that connection? Secondly, what happens if I am at the airport and see that my initial flight is delayed before I even board the first flight? Will United/Air Canada do something like put me on a direct flight to LAX instead if I request that? I have a meeting in Anaheim at 5pm that day….and all of the connecting flights that I would be able to catch out of O’Hare would put me arriving later than when I need to be there. I know at this point the best I can do is follow these awesome tips and cross my fingers, but any help would be appreciated. Oh, and I also know there is a 6:30 United/Air Canada flight that leaves for O’Hare that same morning…..if they post a delay for my second flight, any likelihood that I could convince them at the ticket counter to put me on the earlier flight without forcing me to pay the fee? I think it’s crazy that they allow a 45 minute connection time at O’Hare in the first place! Hi Martina! If your first flight is delayed, the airline should be able to get you on another flight. I’m not sure what they would do if you’re still in Toronto, but my guess is it would take quite a long delay for them to switch you onto a completely different flight out of Toronto, especially if there are other flights from Chicago to Anaheim. And chances are they won’t know if your flight is delayed yet at the point when you’re checking in. Having the Nexus card should help to get you through US customs faster. It’s very possible you’ll have enough time to make your connection, but I agree that it seems tight. I think the best you can do is move through as fast as possible and hope for the best. And try not to worry about flight delays, because if it’s the airline’s fault you miss your connection, they shouldn’t charge you to get on a different flight. We are flying to London on United this Friday. Our original layover was 1.5hrs, but I got notified that the layover has changed to 36 minutes. Is there anything we can do to get switched to an earlier flight to Houston without paying a fee? We are traveling with our children, ages 5 and 7. I don’t think it will be possible to make our connection. Hi Nancy! That’s rough! I don’t know IAH very well, so I’m not sure if there’s even a chance that your DFW-IAH flight will land in the same terminal that your IAH-LHR flight leaves from, but my guess is no. I’d probably call United and point out the extremely short layover and see if they are willing to switch you to an earlier flight out of DFW. If they won’t change your flight without a fee, find out what happens if you miss your connection if the DFW-IAH flight is on time. If you miss your connection because that flight is delayed, it’s up to United to figure out how to get you to London, but usually if the flight is on time but you still miss the connection, airlines aren’t very helpful. In this case though, they really haven’t given you much time to get off the first flight, switch terminals (most likely), and board the next flight before they close the doors. They probably have several flights a day between DFW and IAH but probably only one or two to LHR, so fingers cross they will let you switch that earlier flight. I am flying from Philadelphia to Sydney this May, and I am afraid I won’t have enough time to make my connecting flight in SFO. My layover is 49 minutes and my flights are all through United. Since it’s the same airline, my luggage will be transferred through all the flights and I won’t see it again until I arrive in Sydney, right? What do I do if I miss my connecting flight? This is my first time traveling alone and my first time out of the country, so I have no idea what I am doing. Thanks! Hi Jackie! A 49 minute layover is pretty short! Luckily when you’re leaving the US, there isn’t any sort of passport control or immigration procedures. Your luggage should get tagged to go all the way to Sydney, so you won’t have to worry about that in SFO. Here’s a map of the SFO airport and according to this page United uses terminal 3, which means you won’t have too far to go to get to the international terminal. It looks like the terminals are all linked after security, so you shouldn’t have to go through TSA again. So even though 49 minutes is tight, it’s not impossible. If you’re worried, I’d suggest calling United and seeing if they would charge you to change your Philadelphia to San Francisco flight to an earlier one. If they can’t change it or it’s expensive, ask them how they handle missed connections when the first flight is NOT late. Also, in case this is the same route you’ll take flying back, when you land in SFO (or wherever you first land back in the US) you WILL have to claim and recheck your luggage. You’ll also have to go through passport control/immigration and customs and you’ll have to go through TSA again. Since this will all take a lot longer, I usually recommend at least 2 hours if not more to make sure you don’t miss your connection. Enjoy your trip, and if you need any Australia tips, check out the Australia section of the site here! So, I have a 35 minute domestic layover. Will I have time to get to my flight and will my luggage make it? I know sometimes it can take awhile to deplane, but I thought I’d see if anyone has any other tips for me. Also, I’m pretty good about not wasting time. I’ve been to Australia,Japan and Italy thusfar. Hi Brooke! Yikes, 35 minutes is really tight. I once timed how long it took me to get off the plane, and it was 20 minutes from row 14. It doesn’t look like Portland is a huge airport, so that’s helpful. Here’s the terminal map: https://www2.portofportland.com/PDX/TerminalMap. I think if you can get yourself an aisle seat on the first flight and as close to the front as possible, and have your carry-on all packed up before landing, you can jump up the second the seatbelt sign goes off and see how far you can get before everyone in front of you crowds into the aisle. Once you get off the plane, figure out where you need to go, and GO. (I know this isn’t groundbreaking info.) Also, according to this site Alaska Airlines uses A, B, and C, which means you hopefully won’t have to go too far to get to your next gate. Whether your checked luggage makes the connection really depends on how quick the baggage handlers are at their job, but they do start unloading the plane as soon as it’s parked, so your bag could be off the plane before you are. If you can’t change either flight, I say cross your fingers and make a run for it! I hope you make it! Hmm…I think it would be good to ask them if they have a list of connecting gates, and let them know you have a tight connection. Maybe they can help, but I’m not sure how much they’re able to do. Sometimes flights do actually wait for passengers from a connecting flight, but I don’t know what the protocol is. I’m flying from Vancouver to Florence via Munich. The first flight is Lufthansa, then I have an hour layover in Munich, terminal 2, and then Air Dolomiti to Florence. Do I have enough time? Hi Maureen! One hour might be a little tight, but it’s not impossible. You’ll have to go through customs and immigration in Munich to get stamped into the Schengen Zone, and you’ll probably have to go through security again. If both flights were booked together on one itinerary, your checked luggage should be tagged to get transferred from Lufthansa to Air Dolomiti, but if you booked them separately, you’ll have to pick up your luggage and re-check it for the second flight. In that case, I don’t think an hour would be long enough. Thanks! I’m doing carry on only, so that I don’t have to worry about luggage. Hi! I’m flying to Seoul, SK from Atlanta, GA through Canada Airlines with a 1 hr 46 minute layover in Toronto. Do you think I’ll have enough time? I’m flying from MEL into LAX , then connecting flight to IAH then to PNS all with United Airlines and on the same itinerary and I’m very confused about where my bags go and if I’m supposed to pick them up and check them in at LAX and the other airports or if the Airline will just send my bags from MEL to PNS automatically. And the same on the way home DFW, to IAH to LAX to MEL, will I have to recheck my bags? I’m quite confused, anything would be helpful. I have a 2 hour layover at LAX for my connecting flight to IAH and on the way home I have an hour and 30 minute layover at LAX for my flight to MEL. Hi Angela! You’ll have to claim and recheck your bags in LAX when you’re coming into the US, but on all other legs, your luggage will be transferred from one flight to the next. When you’re leaving the US, you’ll check your bags in DFW and pick them up when you get back to MEL, and they’ll be transferred from one flight to the next along the way. A 2 hour layover in LAX when entering the US could be tight, but it all depends on how many other flights are landing around the same time as yours. I wouldn’t worry much about the one on the way back to MEL though. It’ll be a first time flying soon.I’m getting a one way international flight from CAE -KUL. I have 1h 23m layover between CAE -DFW. Then 1hr 50m layover from DFW – KUL. I will have one checked bag and one carry on with me. Do you think I have any problems catching flights? Also, do I take my bags after each flight and and recheck it back in? I’m a little confused about your flights. It sounds like you’re starting in CAE, flying to DFW where you’ll have a layover, and then flying from DFW to KUL. I don’t understand the 2 different layover times if your only layover is in DFW but maybe I’m missing something there. Your bags will be tagged to go to your final destination as long as your flights are all booked on one itinerary. (In other words, if you did NOT book them separately, as separate transactions.) So you shouldn’t have to recheck your bags for each flight, they’ll get transferred for you. You might have to go through security again in DFW depending on which terminal you land in and which one your next flight is in. Here’s a map of DFW’s terminals so you can see which airlines use which terminals, and which terminals are connected: https://www.dfwairport.com/map/. I think you’ll have enough time for your layover, especially if it’s the longer time you mentioned, but I recommend going straight to your next gate and not stopping anywhere until you know where you’re going. If you want a snack or something, get to your gate first and see if you have time, that way if you’re running short on time, you don’t miss your flight because you stopped at a shop somewhere. I hope this helps, and enjoy your trip! Thanks for the info. I’m relieved about the checked bags. The DFW goes to Hong Kong(HKG). That’s were I have the second layover. From Hong Kong I go to Malaysia.I haven’t officially booked a flight yet but I’m also looking at another flight where 43m layover from DFW to Hong Kong. Would that be too short? I think 43 minutes would make me nervous. You’ll probably have to change terminals, and depending on which terminals you’re going to/from you might have to go through security again. If the only major difference is a shorter layover in DFW, I’d go with the longer layover. Hello! We are flying in from Mexico City to LAX on the Sunday after Thanksgiving which I know is a very busy travel day. We will have 3 hours to get through immigration, get our bags, get through customs, and then get through security before our connecting flight home. – Sorry if that is in the wrong order, this is my first international flight. Do you think a 3 hour layover is enough time on such a busy travel day at LAX? Hi Renee! I think 3 hours should be long enough. There’s always a chance the lines are super long, but I would definitely be willing to book a flight with that layover. And I typically think of Thanksgiving weekend as busy for domestic travel, not international travel, so maybe the lines at immigration and customs won’t be so bad, but going through security again to get to your next flight might have long lines. I can’t make you any guarantees, but I think 3 hours should be fine. I’m flying from Bonaire BON Sunday to Houston IAH with a connection to Fort myers. RSW. If I’m flying on the same itenerary and using the same United airline do I need to collect my luggage in Houston then go through customs and TSA? Hi Larry! Unfortunately yes, you will need to go collect your checked luggage in Houston during the customs process because Houston is your port of entry into the US. You will also have to go through TSA again before continuing to your connecting gate. Many airports make it pretty quick and easy to claim and recheck luggage when coming off an international flight and continuing to another flight, but I’m not sure what Houston’s set up is as I haven’t flown through there. I’m flying from NYC to Santorini but a layover of 50 mins in London. Same airline (British Airways) but different terminal. I’m planning on having a checked bag. Do you think 50 mins is enough? Since it’s the same airline they will transfer my luggage from first flight to second flight right? Hi Tiffany! 50 minutes might be tight, but not impossible. The airline should tag your luggage to go to Santorini, so I wouldn’t worry about that too much. You might have to go through security again to change terminals, which could take some time. I don’t know which London airport you’re flying through, but do a search for the airport and “terminal map” and see if you can find something that shows where the security checkpoints are. You shouldn’t have to deal with UK passport control since you’re not staying in the UK, but I have heard of people having to do it, and in that case, I don’t think 50 minutes is enough time. I’d suggest calling British Airways and asking if they know if you’ll be able to bypass that since you’re final destination is Greece. Chances are you won’t have to deal with passport control in London, but it’s worth checking with the airline. I booked flights today from JFK to Juneau, JNU Alaska with 30 min layover on SEA (Seattle) …. Both flights are offered by Delta as one itinerary. There was no other option with even close price. Do you think it is doable? Already found map of SEA, hard to say if it is huge, but looks like it is one quit big terminal. Already selected seats but will switch them to aile ones, thanks to that site. Hi Yelena! A 30 minute layover is pretty tight, but if that was the only reasonable option for you, I totally get it. Delta has a map on their site here that shows what parts of the airport they use, so that’s helpful. It looks like they’re in A, B, and the South Satellite, so if you land in one of those and take off from the same one, it’s probably really close, but if you have to switch, it looks like you’d have to take the shuttle train in some cases. I’d say definitely try to get your seat changed to an aisle seat as close to the front of the plane as possible. If you miss your connection because the first flight is late, the airline will rebook you. If the flight is on time but you miss the connection anyway, most airlines put the responsibility on you unfortunately. I have no idea what your travel insurance might cover so you should ask them if they would cover a hotel in this situation. Another thing you can look at is on Delta’s website, go to where you can check the status of a flight and check both of your flights for the next few days and see if they always use the same gates or at least the same concourses (A, B, South Satellite) and that way you’ll know if your first flight is likely to land in one area and the second flight is likely to take off in another. You can also talk to the flight attendants on your first flight and see if they have a way of contacting the gate agent of the next flight to tell them you’re coming. It’s a long shot, but they might be able to wait for you for a few extra minutes. Mostly, find out your connecting gate as quickly as possible and get ready to run if you have to! Good luck, and enjoy your trip! Thank you, really appreciate your prompt response !!! Hi! So I have a flight from LA to Korea with a 1h15min layover in Hong Kong through Cathay Pacific. It’s on the same itinerary and I will be staying in the same terminal. Plus I know Cathay Pacific has a great reputation. Despite that, I’m nervous since this is my first layover and I’m not an experienced international flyer(I’ve flown a lot domestically in the US). How tight will the layover be? Hi Valeria! You shouldn’t have to go through customs in Hong Kong since you’re not staying there, but you might have to go through security, depending on how the terminal is set up. But it sounds like you shouldn’t have any issues. I wouldn’t worry about a 1 hour 15 minute layover when you don’t have to deal with immigration and customs. Find your next gate as soon as you get off the first flight so you know where you’re going, and then you’ll know how much time you have if you need to find food or something. Enjoy your trip! Hi Ali! I’m flying from LAX to Manila with a 55 min layover in Seoul-Incheon Airport. There will be 4 of us flying and initially the itinerary we booked had a 2+ hr layover, but the airline kept changing the flight so that the layover was getting shorter and shorter to the point that it was now 55 minutes long. Do you think that would be enough time to catch the next flight? And my guess is that our checked luggage would be left behind because of the short layover. It is the same airline and same itinerary so I’m holding a bit of hope out! Hi Rachael! Ugh, I hate when the airlines do that! Since you’re not staying in South Korea, you shouldn’t have to go through customs and immigration (look for signs that say “transit” or “transfer” or “connecting flights”) so even though I don’t think you’ll have time to waste, I do think there’s a good possibility you’ll make it. You might have to go through security again, so be prepared for that. As for your luggage, I also think there’s a decent chance they’ll be able to get it to your next flight. But make sure you have valuables and a change of clothes in your carry-on just in case it doesn’t make the connection. 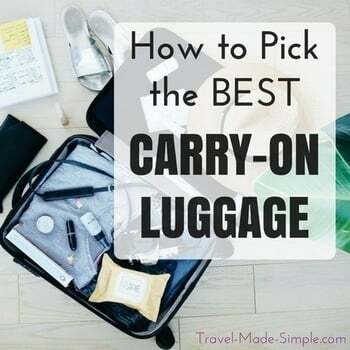 I can’t make any guarantees, but follow my layover tips here, like making sure your carry-on bag is packed up and ready before you land, and going to the bathroom on the plane so you don’t have to worry about it at the airport, and see if you can get an aisle seat as close to the front of the plane as possible, and I think you have a good chance of making it. Enjoy your trip! I have a flight from NRT-EWR-ORF with a 40 minutes layover between EWR-ORF. This will be through United. Is EWR a hectic enough airport that I will surely miss my connecting flight? If it helps any, I do have GE. Thank you! I do think 40 minutes is extremely short for making your connection. Having Global Entry helps, but I don’t know how much time it really saves you compared with the length of your layover. It takes time just to get off the plane once you’re at the gate. (Once I timed it, and it took me 15 minutes from the moment they opened the door until I got off the plane, and I was sitting in row 10.) It’s probably worth contacting United and asking them what their procedure is if you miss your connection due to dealing with customs and security on such a short layover. I think definitely try to get an aisle seat as close to the front of the plane as possible. Don’t even think about using the bathroom in Newark, definitely do that on the plane before you land. And maybe you’ll get lucky? I don’t like your odds on this one though. I am in bit of a panic. I am flying to maui from vancouver via seattle with delta airlines and there is onlu a 30 min layover. We will have our toddler with us as well. Is such a short layover even realistic? Hi Ramina! A 30 minute layover is quite short. You should be able to do US customs and immigration in the Vancouver airport before your flight (so leave plenty of time for that) so that helps a ton…see more info here: http://www.yvr.ca/en/passengers/navigate-yvr/customs-and-immigration/us-customs-and-border-protection. I’m not sure if you’ll have to go through security again in Seattle though because every airport is different and I haven’t flown through Seattle in awhile. According to this website, Delta uses concourse A, which means you’ll land and take off from the same concourse, which means you shouldn’t have to go through security again and it shouldn’t take too long to get to your next gate. (I make no guarantees though, that’s a 3rd party site, I’m having trouble finding that info on the airport’s site.) I still think 30 minutes is really cutting it close. If you decide to stick with this flight, do whatever you can to get your seats switched to be as close to the door as possible so you can get off the first flight ASAP. See if you can find out your 2nd gate number ahead of time. But really, if you can get Delta to put you on an earlier flight from Vancouver to Seattle, you’ll be less stressed and less likely to miss your connection. I’m not sure I’d feel comfortable with 30 minutes. I am flying to Puerto Vallarta from Omaha. We have a connecting flight in Dallas with a 40 min layover. Both flights are AA and lm wondering if that will be enough time. Only carry on for the flight. Hi Justin! A 40 minute layover is kind of tight, but for your flight leaving the US, it shouldn’t be so bad. The US doesn’t do any sort of exiting passport control, so when you get to Dallas, you just have to find your next gate. It looks like all terminals are connected passed the security checkpoint, which means you shouldn’t have to go through TSA again, but I’m not 100% sure of that. I’d say you don’t have any time to waste, but you can probably make it. Since you’re going carry-on only, you should be able to check in online and print your boarding passes at home, which means you don’t have to go to the check-in counter in Omaha. BUT since you have an international flight, an airline employee will need to see your passport at some point. Normally the person checking you in would look at your passport, but if you check in online and skip that part, your name will go on a list, and you’ll have to go talk to the gate agent in Dallas. It’s a simple thing, happens to me all the time because I always go carry-on only. But if you want to save time in Dallas, go to the gate agent in Omaha and tell them your next flight is international and you know the airline needs to see your passport. That person should be able to look you up, check your passport, and un-flag you for the DFW to Puerto Vallarta flight. One last thing – Coming back from Mexico, you’ll have to go through US immigration and customs in DFW (assuming your return flight connects there as well) so that will take a bit longer. A 40 minute layover might not be enough time, so hopefully you have a little longer on the way home. Have a fun trip! I am travelling 13th december and returning back on 25th january . I have two stops while going and coming back . LHR (london) its common while going and coming back. But i have 2.30 hours of layover while going From Dallas, USA to Mumbai India and while coming back i have 1.45 hours of layover and have all through check in. Will i make it ? Hi Apoorva! London is a tricky one. Sometimes you have to go through immigration and customs, sometimes you don’t. Normally I tell people when transiting through a country like you’re doing, to look for signs that say “transit” or “transfer” or “connecting flights” and you should be able to bypass immigration and customs. This works in most, but not all, countries. So if you DON’T have to go through customs and immigration, it really shouldn’t take you long to make your connection. You’ll most likely have to go through security again, but that’s it. And any checked luggage you have should get tagged to your final destination and transferred from one flight to the next, as long as you’ve booked the whole thing on one itinerary. So in that case, I think both of your layovers should be fine. If you DO have to go through customs and immigration, it really depends on how long the lines are at the time you arrive. You could still be fine to make your connection, but you could wait in line for an hour. It’s impossible to know ahead of time. I hope that helps at least a little! Hi there! I’m looking to book a flight from Cincinnati to Wilmington, NC, with a layover in ORD. Plane departs on 1/19/19. I have a 35 minute layover. I know the time is tight, but I need to reach CLT as early as possible and that’s the only option at a reasonable price. If I call the airlines and let them know I’ll be arriving, will they alert until gate for the flight leaving to CLT? Do you think I could arrive at the airport and try for an earlier flight through Chicago? This way I’ll have more time. What is your opinon? Thank you! Hi Mary! ORD is a notoriously tricky airport for layovers. The airline will generally only hold a flight if there are a lot of people connecting. If you can look at which terminals your airline uses, and even historically which gates the two flights you’re looking at use, you might be able to decide if they use the same terminal, which would make it pretty easy to get from one to the other. Some airlines will let you take an earlier flight, but usually it’s for a fee. You could find out what that fee is and decide if it’s cheaper than just buying the earlier flight. A 35 minute layover is definitely cutting it close. I timed myself getting off a plane once, and from row 10 it took me 15 minutes from the moment the plane pulled up to the gate. So even if you’re closer and it goes faster, you’re looking at about 10 minutes minimum to get off the plane. Then however long it takes to get to your next gate. I had a 35 minute layover in Vegas once, which is smaller than ORD, and I had to run and I was the last person on the plane. So while it’s not impossible, I personally wouldn’t feel comfortable with that short of a layover. Your call though. I am looking at flights from Turks and Caicos (PLS) to SFO. Stopping in MIA airport for a 2 hour layover. I’ve never been to MIA airport. Will it be cutting it short? My other option is flying thru CLT with a 1.5 hour layover. I’ve never been to either of those airports so I’m not sure how the customs thing will go. I should mention that I’ll have two small kids (2 & 4) to schlep around with me. Any thoughts? Is either airport better than the other? All flights would be with American Airlines and on the same itinerary. Hi Alyssa! That’s a tough call! The Miami airport is well known for long lines at immigration. CLT is a smaller airport, but 1.5 hours is a little tight if there are lines at immigration there. I might lean slightly more towards MIA because there’s a little more time, and it looks like there’s a shuttle between terminals, which could make things a little faster once you clear customs and easier with the kids. But it’s really a judgement call, if you feel more comfortable with a somewhat smaller airport, CLT might be better. Sorry I can’t give you a definite answer on this one, but I don’t think you can make a wrong choice. Hey Ali! I recently booked a trip to Saint Martin without considering the length of a layover being a concern. I booked through Expedia and am flying from Philadelphia (PHL) to Philipsburg Saint Martin (SXM) with a 40 minute layover in Fort Lauderdale (FLL). The airline is Jetblue for both of these flights but I am not sure if we will have enough time to make our connection! When landing at FLL from PHL, what is the first thing we will have to do? Do we need to pick up our checked baggage and get it re-checked? Or will we not even have to worry about our checked luggage at all? I am also wondering how much time it will take to get from our flight from PHL to our new flight at FLL if they are located in the same terminal (Terminal 3 according to our itinerary). Thanks! Hi Katelyn! Flying OUT of the US isn’t really a big deal – you won’t have to do anything special, your luggage will get transferred from one flight to the next (assuming you booked both flights together on the same itinerary) and there isn’t any formal exiting passport control. The airline employee who checks you in for your first flight will probably look at your passport, but that’s about it. If you check in online, go to the gate agent in PHL and tell them your next flight is international, and they should be able to look you up and verify your passport for their records so you won’t have to worry about it in FLL. If your first flight lands in the same terminal as the second flight, you just have to go find your next gate. I’d say you still don’t have any time to waste, because it takes time just to get off the plane, but it’s not a totally impossible layover. If you can get an aisle seat as close to the front of the plane as possible, that will help you get off the plane faster. What’s your return flight like? You’ll need more time for the layover on the way back. When you fly back to the US, whatever airport is your first in the country will be where you do US customs and immigration. You’ll also have to claim and recheck your luggage. I’d aim for at least 2 hours for that layover, maybe longer for certain airports. Thanks so much for the info! Our return flight also has a layover at FLL but the layover is about 4 hours long so I think we will be fine there. That’s plenty of time! Have a great trip! Thanks for all the tips, we’ll definitely be applying them to our September trip to Hawaii. Admittedly when booking our tickets I miscalculated the layover (time changes :/) and saw that we only had a 49 minute layover at Denver, and an hour at LAX on American Airlines. To add insult to injury it’s on labor day weekend. We fly out Sunday, single itinerary CLT, DIA, LAX, to HNL, but I’m worried about those short layovers with the multiple connections on a holiday weekend. We are pretty close to the back, so that’s another negative. Obviously in hindsight the deal wasn’t worth the stress I’m feeling, but do you think those short layovers are doable on a holiday weekend. Hi Ashley! It mostly depends on where one plane lands and the next one takes off. If they’re in the same terminal, it shouldn’t take long at all to get to the next gate. The biggest issue would be if you have to switch to a different terminal AND if there’s no way to get from one terminal to another without having to go through security again. Most airports are set up so you don’t have to go through security again when connecting on domestic flights, but LAX does have some that would require you to go through security again. If you can figure out where your flights land and take off, that would help. You can’t really know for sure ahead of time, but you can look at which terminals American Airlines normally uses, and you can even see which terminals your specific flights typically use each day for a few days and see if it’s consistent. Here’s some info about connecting in LAX: https://www.flylax.com/en/inter-terminal-connections. When I look at the Denver airport website, it sounds like their terminals are all connected beyond security, so you shouldn’t have that problem. You could still try to get your seats changed so you’re closer to the front of the plane. If that’s not possible, just make sure you’re ready to go when the plane lands and don’t stop in the airport until you get to your next gate and know how much time you have left. Those layover times don’t sound impossible, just a little stressy. Denver isn’t a huge airport, so I’d be less worried about that one. As for the holiday weekend, the worst of that is usually dealing with security, so give yourself plenty of time ahead of the first flight. I’ve never missed a connection that did NOT involve my first flight being delayed, so this is based on what I’ve been told whenever I ask the airlines how they handle a missed connection when the layover time is short but there’s no flight delay. I am flying from DTW to ATL to KIN on my return flight I fly from KIN to JFK to DTW. at JFK i was told by the airline i need to get my luggage and recheck it. i have a 6 and a half hour layover in JFK. if i was to leave the airport do i have to go back through customs and immigration or just tsa? Hi Andrela! When you land in JFK, you’ll go through customs and immigration to enter the US, and yes, you’ll have to claim and recheck your luggage. After that, if you want to leave the airport during your layover you can, but I’m not sure you’ll have much time for it. It’ll take some time to get through customs and immigration and dealing with your luggage. Then transport time into the city, plus the time to get back to the airport. You’ll need to be back at the airport about an hour or so before your next flight so you can get through security (but not customs or immigration, that’s only when entering the country). Do the research on how long it takes to get from the airport to wherever it is you want to go in the city, make note of how often the train runs, add a little buffer in case of delays, and then double that to account for getting back to the airport. Plus add in the hour you’ll need ahead of your JFK-DTW flight and probably an hour or so for customs and immigration when you first arrive at JFK. My guess is you’ll have maybe 2 hours tops to do something in the city. I’m flying from London Gatwick to LAX with a 2 hour layover at DFW. Upon reading this I am very concerned. Do you think I will have enough time? Hi Lucy! It really comes down to how long the lines are at immigration. If the lines are short and/or they’re moving quickly, 2 hours could be plenty of time. It’s not short enough for me to worry much, just know that you don’t really have time to waste until you get through customs and immigration and security. Hi Rachel! You didn’t say where you’re flying to, but I’ll do the best I can with this one. You mentioned immigration, which makes me think you’re flying from SEA to LAX to somewhere outside the US. If that’s the case, you don’t have to worry about exiting immigration/passport control. The US doesn’t do that. The airline will want to see your passport, but they’ll do that when you check in for your flight, or if you’re able to check in online, you’ll probably have to go to the gate agent so they can look at your passport and clear you in their system before boarding. I’ve had this happen before, and usually there’s a list of passengers they need to see before the international flight, but I recommend going to the gate agent yourself in SEA to save time. Then regardless of whether you’re checking in online or in person in SEA, when you get to LAX, you just have to find your next gate on the departures board and then follow the signs to that terminal. This site has some good info about getting around in LAX: https://www.ifly.com/los-angeles-international-airport/terminal-map. And if you happen to know which terminal your SEA-LAX flight lands in and which terminal your next one leaves from, you can use their little tool at the top to get instructions of how to get from one terminal to the next and whether you have to go through security again. I hope this helps!